As a little side project, I decided a while back to create a full eBook version of Fallout: Equestria Project Horizons for my own use. I couldn't read it in Google Docs due to the same injury which ended up resulting in me listening to Fallout: Equestria in the first place (and starting all this madness). Well, back then, the book was only complete to Chapter 73 or 74. I don't remember quite which one. So I'm happy to present (with Somber's blessing, I might add), Fallout: Equestria Project Horizons (Immersive Edition). But this one's special. Because a lot of fine tuning went into this (yup, the adage, "Do it right, do it with style" is still in effect). Please note that this is not a spelling, grammar or content edit. This is a format edit only. Novel Idea and the Manehattan Project are not offering any commentary, opinion or review on Project Horizons aside from the fact that "Kissed by Discord" is probably the greatest perk name in the history of Fallout. This edition was generated from copy/pasting the entirety of the novel from the Google Docs page. There also may be a few odd intra-chapter breaks that got missed. I skimmed literally the entire book to do this and also noted it on my iPad as I was reading through it myself. It took a lot of work, including actually digging into the XML/CSS that eBooks are built from. Scrivener was awesome for the initial compilation, but it couldn't do links or the fine-tuning I wanted. Sigil was the primary program I used after the initial compilation and was used for pretty much every change after V3.0. Please Note - Fallout: Equestria Project Horizons is a great deal darker than the original Fallout: Equestria. 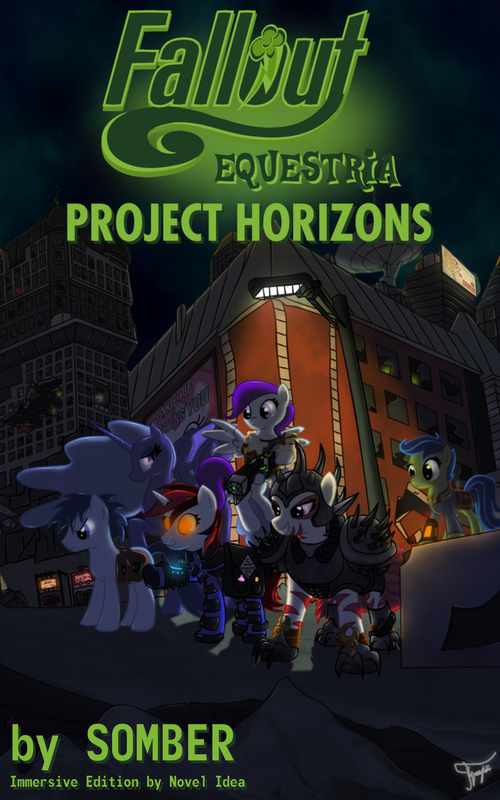 If Fallout: Equestria deserves the tag [Grimdark], Project Horizons deserves it several times over. Please use discretion before reading this story. Edits were made to the formatting of the chapter quotes, footnotes and content warnings for consistency. Content warnings are now verified links that will skip the relevant section to the next "safe" point. Most section, memory orb, dream and other styles of intra-chapter breaks have been cleaned and fixed to allow for a consistent reading experience. Custom Table of Contents. (Fixed double entry for Chapter 14). Fixed over 23,000 paragraph indents to a constant tab indent instead of spaced indents. Changed Footnote line breaks to full horizontal line breaks. Changed all text to be LEFT paragraph justified instead of JUSTIFIED. Removed "hard spaces" causing double/triple spaces in locations and throwing off all paragraph spacing. Changed several footnotes to be more consistent with Fallout or Fallout: Equestria. Only the ePub version has been fine-tuned. Both the PDF and the MOBI versions were created using online conversion tools. They have not been tested or verified. I strongly recommend using the ePub version. The story behind Gardens of Equestria is based solely on the original work of Kkat for Fallout: Equestria. In the "canon" of GoE, the events of Project Horizons did not occur. I have my own personal headcanon for what happened in the GoE-associated version of Equestria in the Hoofington region, but that's beyond the scope of GoE. I'm providing this ebook as a service to the FO:E Community and because Somber climbed one hell of a mountain to finish a 1.5 million word novel (and I thought I was verbose).